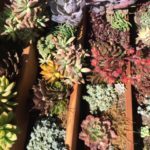 Home » Blog » Succulent Wall Backdrop Anyone? 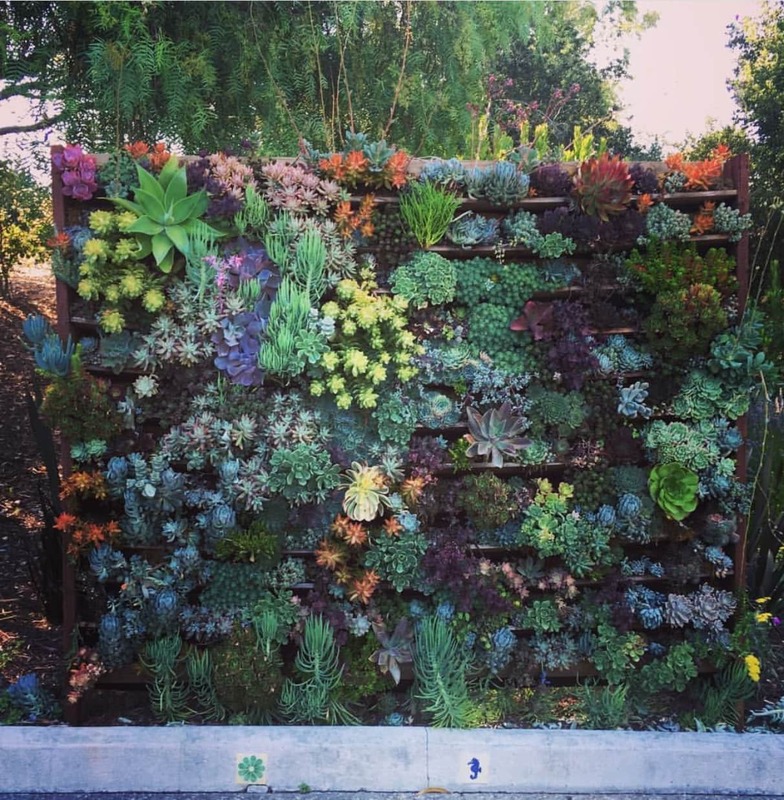 Posted by Pat Goetz in Blog | Comments Off on Succulent Wall Backdrop Anyone? The Suc­cu­lent Wall Back­drop, com­plet­ed! But, I real­ly want­ed to do a bet­ter job hid­ing our well pump this win­ter and replac­ing the old ‘blind’ we had cre­at­ed a few years ago. Since wed­ding guests and lodgers see this area when they first arrive at the estate, I want­ed to remove this one unat­trac­tive area that need­ed a make over. Cre­at­ing a suc­cu­lent wall back­drop for wed­dings seemed like a cool solu­tion. So, like many of our brides, I scoured Pin­ter­est for great ideas and came up with the con­cept of a suc­cu­lent wall–and some­where on the way, I hap­pened to scope out full wed­ding back­drops from botan­i­cal gar­dens and tem­po­rary struc­tures that cou­ples cre­at­ed. To my poor handy husband’s cha­grin, our project dou­bled in size along the way to cre­ate this 8 foot tall, 400 suc­cu­lent strong liv­ing gar­den! er Joey Gre­ja­da, lend­ing a hand, I did want to doc­u­ment how we did it and I think if we are suc­cess­ful long term, you will see it in our @thecasitasestate tags and hash­tags via social media. I also feel my babies will keep grow­ing and sup­ply more of my sev­en acres with even more sus­tain­able, drought tol­er­ant suc­cu­lent gar­dens. I’m so excit­ed about that and already have friends ask­ing to trade plants from my suc­cu­lent wall around the Cen­tral Coast. 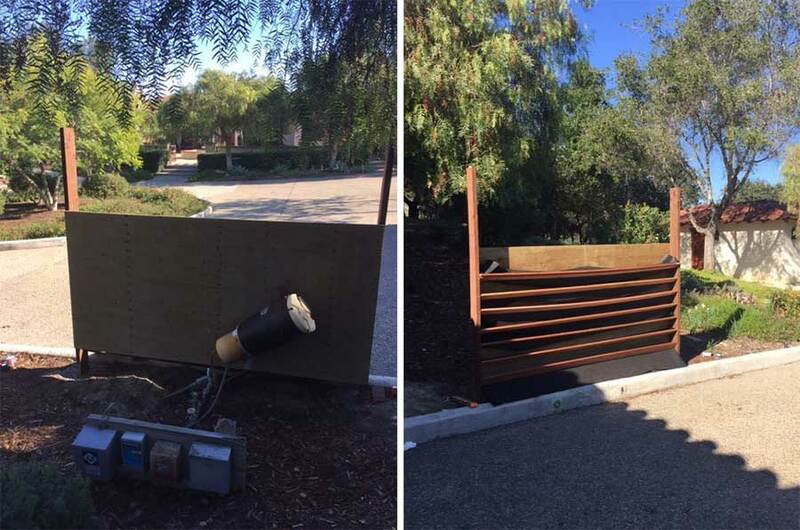 So we used pre-treat­ed ply­wood to resist water rot and anchored two 10 foot 2X6 pre-treat­ed boards 8′ apart in con­crete and then used 10 1X4 red­wood planks as rows. In hind­sight, I won­dered if I should have tried build­ing the suc­cu­lent wall with chick­en wire where all the suc­cu­lents could be ‘cut in’ as need­ed. This would allow a tighter palate, but I do like the uni­for­mi­ty each ‘shelf’ offered to hold in the soil and retain water. Time will tell of course. My good friend Lau­ra Greaves of Viva La Suc­cu­lents stopped in to impart wis­dom! 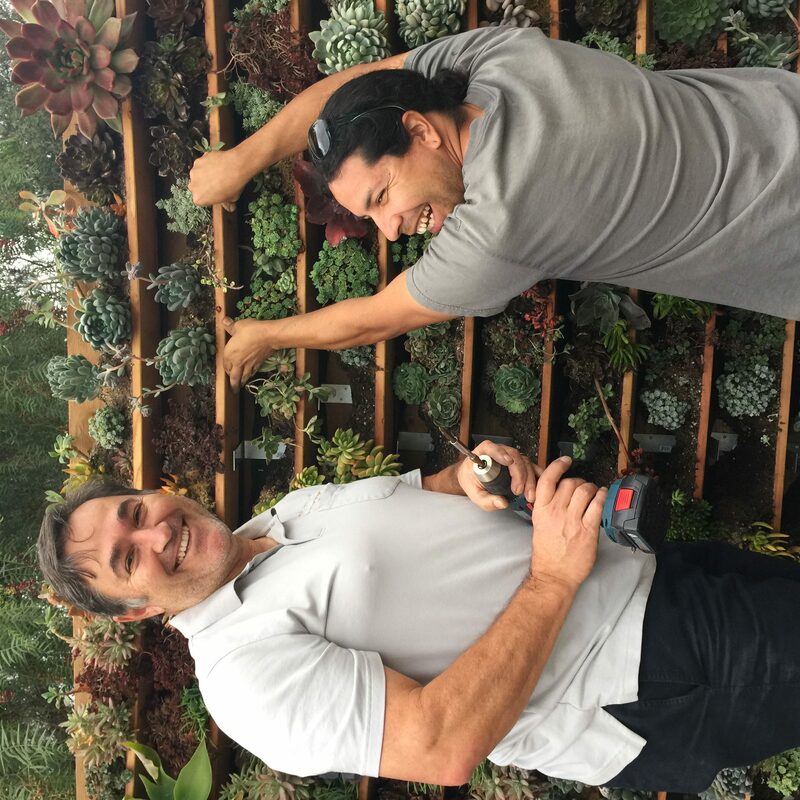 If you are a suc­cu­lent lover, I will share that no one inspired me more than the won­der­ful help­ful blog­posts from Matt of DIY Green­walls and of course, the world famous Patrick Blanc -he is off the charts amaz­ing. We plan to dine at Juvia, one of the restaurant’s he installed in Mia­mi lat­er this Spring! (Look at their ‘ambi­ence’ tab for a real treat.) Maybe we are the only cen­tral coast wed­ding venue with this unique fea­ture to offer! After the red­wood shelves were placed, I cut 8′ long strips of per­me­able gar­den fab­ric and used a sta­ple gun to cre­ate a pock­et for every row. The fab­ric is the type that will allow water to flow, pos­si­bly slow­er as it trick­les down, but would hold soil in place for each row of suc­cu­lents so they have a uni­form envi­ron­ment to grow into. I need to keep this entire wall look­ing hap­py and healthy for images our bridal cou­ples. Lodg­ing guests might choose to take dur­ing their stays here too! I think this method is actu­al­ly work­ing quite well. 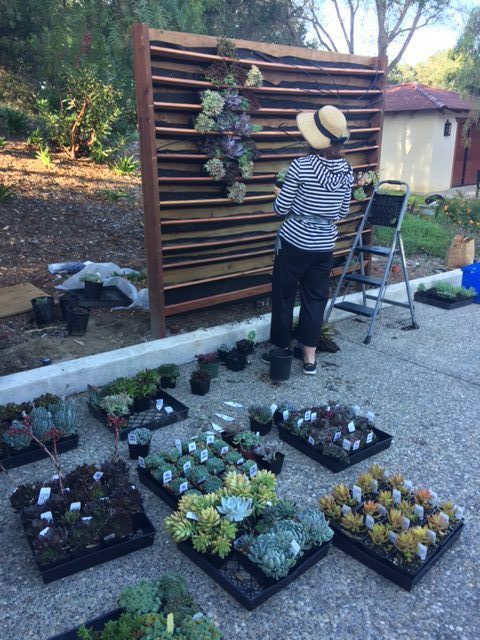 My hope is that once each succulent’s roots take hold and min­gle, the wall will become that much hap­pi­er and the red­wood slats will dis­ap­pear as they pati­na any­way. Soon in, we did real­ize that the weight of the plants, soil and water would cause bow­ing in the cen­ter of the 8′ planks, so Tony and Joey added L-brack­ets as sup­ports and I did a pret­ty good job of hid­ing them with moss or a dou­ble stacked set of suc­cu­lents in a giv­en row. I think this did the trick. Tony and Joey, the Abstract Arborist, with an assist! Joey, our gar­den­er, also helped me by adding a new sta­tion. We used drip irri­ga­tion for each and every row. This way the water­ing would be uni­form through­out the struc­ture and not allow the top to dry out or water to set­tle and have the low­er plants much hap­pi­er. We are still going to have to play with this aspect over time, but hold cau­tious opti­mism. In the mean­time, I have a nice mist wand that I am using to baby each row and water uni­form­ly at this stage. I feel the drip isn’t enough solo while the plants have not root­ed them­selves in the struc­ture. Found these babies at Home Depot for $5.99 and divid­ed them up, giv­ing me $1 plants. 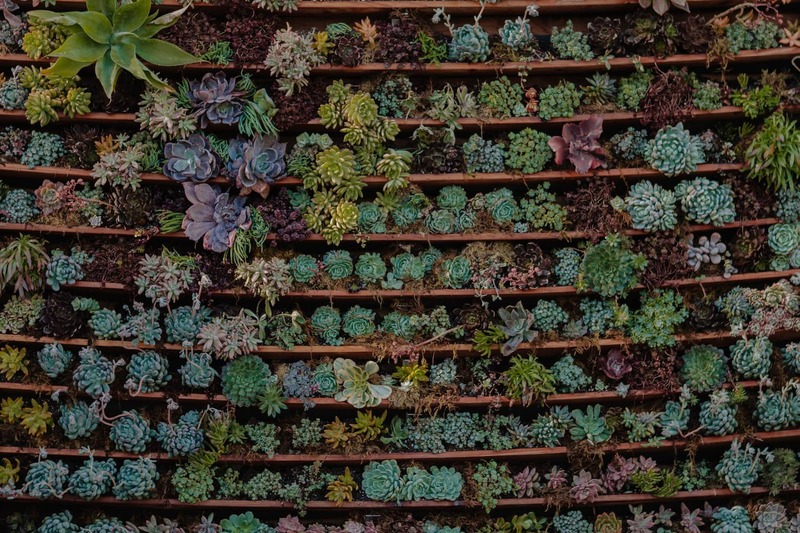 You may also notice a few key plant­i­ngs on my suc­cu­lent wall with larg­er ‘stun­ners.’ I strate­gi­cal­ly posi­tioned these to show in the images, where a cou­ple wouldn’t be stand­ing. This includes an agave that will cer­tain­ly over­grow the struc­ture in 4–8 months and need to be replaced. 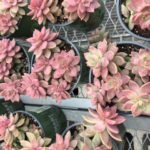 Sourc­ing the plants for the wall was also a fun albeit cost­ly project, but I was able to find some six packs at local nurs­eries. Some had large clus­ters of plants I could sep­a­rate. Hav­ing amaz­ing local places for suc­cu­lents like Native Son and Grow­ing Grounds didn’t hurt. I focused on NOT buy­ing green suc­cu­lents, as they are so per­va­sive. This way, if I con­cen­trat­ed on blues, reds, pur­ples and the occa­sion­al yel­low, maroon and oranges, the greens wouldn’t end up over­pow­er­ing the palate. I feel like this was a great move. Even the green suc­cu­lents I used pos­sess a spe­cial qual­i­ty like the flow­ers they pro­duce or col­ors their edges turn when stressed. So, time will tell but ini­tial­ly, I am very hap­py with the bal­ance of my suc­cu­lent wall. Hap­py to hear what you think, we are excit­ed to offer this at our wed­ding venue, and I hope you are enjoy­ing your suc­cu­lent gar­dens as much as I am. Update-as of 7/2017–just six months lat­er, it is thriv­ing. Many guests love it as well as the wed­ding cou­ples and it’s pret­ty pop­u­lar for self­ie walls. I’ve had to replace a few top-heavy suc­cu­lents, and try to con­trol snails that love to eat spe­cif­ic plants, but over­all it’s been a huge hit!